In common with the Schumann First, Gàl’s first symphony came a long time after his first attempts at writing one. This was despite winning the Austrian State Prize with a symphony which he decided to withdraw before its first performance replacing it with another which he also later abandoned. It was only in 1927, 16 years after those attempts, that he wrote this first symphony - one he was happy to consider his first. It did well, receiving second place in a competition held to mark the bicentenary of Schubert’s death. It was performed frequently for the next five years yet, since 1933, it has only been played three times in public, something which is quite unfathomable once you’ve heard it. It is always a complete mystery as to why some composer’s works sink, often without trace, while others from the same period establish a firm place in the repertoire. However, with the advent of a more avant-garde approach to composition by the likes of Schoenberg, Webern and Berg there came a period during which ‘tunes’ were regarded as ‘old hat’, an attitude that later put paid to many a composer’s works during the years following the second world war. Now that writing works that are full of melody is no longer regarded as old-fashioned, music such as his is once again in vogue. What these releases of Gàl’s music on CD will lead to, I hope, is that works such as his symphonies will also be programmed in the concert hall once again. As a great admirer of Gàl I was thrilled on his behalf that in the UK the BBC in May this year devoted five one hour programmes in their Composer of the Week series to him and the expert called upon to help illuminate his life was the conductor on this disc, Kenneth Woods. The programmes are available (in the UK only I believe) to download as a podcast and I urge people to do so for they will learn a great deal about what made him tick musically and will help in their enjoyment of his music. Those not in the UK can still ‘listen again’ to the programmes and at the time of writing they are said to be available indefinitely. If any executives of the BBC ever get to read this review may I put in a plea that Gàl’s music is considered for inclusion in next year’s BBC Proms because on the strength of this symphony it would prove extremely popular. Though substantial, the first is the shortest of Gál's four symphonies. As soon as the first movement begins the overriding and most impressive feature is his innate ability to deal with an orchestra. Everything is perfectly handled and there's a hugely impressive sense of unity and perfect balance. What is evident right from the outset is that Gàl had a real facility to come up with highly colourful tunes which explains the symphony’s initial success. Its subsequent disappearance from the concert hall remains unfathomable. The second movement marked Burleske has a lovely childlike sense of pleasure with rustic overtones while the ensuing Elegie is deeply satisfying, gently phrased and full of gorgeous melodies including a lovely solo from his oft favoured instrument the oboe. The final Rondo, a real orchestral showstopper, bursts into being with exuberance and brio, fairly tripping along only becoming more serious briefly towards the end before finishing with a flourish. The first symphony is an indication of how well formed a composer he was when he wrote it. His other three symphonies - all available on Avie (Symphony 2 ~~ Symphony 3 ~~ Symphony 4) - build upon that. While there doesn’t seem to be any immediately apparent reason to couple his first symphony with that of Schumann it has been the record company Avie’s policy, or perhaps Kenneth Woods’ idea, to couple all of Gàl’s symphonies with those of Schumann, both having written four. Gàl was a great admirer of Schumann and wrote a well respected book Schumann’s Orchestral Music (London: BBC, 1979) though he also was co-editor of ten volumes of Brahms’ complete works. What is interesting, however, is that despite the 86 years that separate the two symphonies the musical language is much closer. 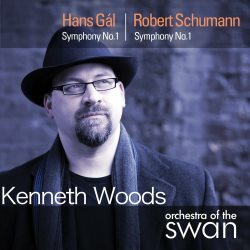 Gàl wrote that Schumann’s first symphony was ‘the most fortunate of Schumann’s symphonies in the first impression it makes ... the most successful use of orchestral colour that Schumann ever succeeded in obtaining’; the same thing can easily and justifiably be said about his own so perhaps the coupling begins to make sense after all. There isn’t much that can be said about Schumann’s Spring symphony that hasn’t been said before many times. It was composed during one of Schumann’s happiest periods. That certainly shows in this perfect example of symphonic writing: richly melodic and abounding in the most memorable tunes. It has been said that I rarely write a negative review but apart from the observation that I doubt that it was Kenneth Woods’ idea to have four photos of him in the brochure plus one on the back of the jewel case, as I’ve said before in a paraphrase of comedian Frank Carson’s famous catchphrase, ‘It’s the way I pick 'em’. Knowing Kenneth Woods’ work both as soloist and conductor it was pretty much a foregone conclusion that he’d do a brilliant job and so he has. He uses an orchestra of equal size for each symphony and which in Schumann’s case is just about identical to the size it was in Schumann's day. Both symphonies sparkle with joie de vivre and I found that I enjoyed the Schumann more than I’ve ever done before for which I thank Mr Woods and the OOTS. The sound is crisp and clear. There’s nothing more to say except that if you’d like a really good recording of the Schumann and you don’t know the Gàl then it’s a win-win situation.